Näkturnal is proud to support the VIA Music & New Media Festival. Please contact us if you are interested in sponsoring the event. VIA’s “Festival As Laboratory” approach highlights the intersection of cutting-edge music and new media art through collaborative performances, installations, mobile projects, lectures and workshops. Full schedule is available here. For an entire week, bands, DJs and producers are paired with visual artists for one-of-a-kind performances that may only be seen once in a lifetime. Experimentation is key. The opportunity to merge a great music lineup with video, interactive artwork, code, and gaming allow the VIA festival to mutate every year, in a way that’s fresh and always a little unexpected. VIA presents what’s next in music along with a smattering of pioneers. A broad spectrum of sounds from noise and pop-punk to hip-hop, juke, house, techno, and progressive electronic just scratch the surface of programming. VIA’s first three years have merited international acclaim from sources such as Resident Advisor (Top 10 Festival 2010, 2011) Interview, Dazed & Confused, Dummy Magazine, and National Geographic Traveler; as well as being celebrated locally by the Pittsburgh City Council, CityPaper, the Sprout Fund, and other outlets. Re-framing city spaces, the festival showcases museums, clubs, and transformed pop-up venues. 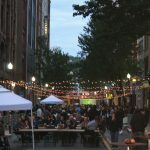 Emphasizing VIA’s literal meaning of “by way of, or passing through” the festival encourages Pittsburgh as a nexus for young artists working at the borders of music, art, and technology. Over 100 musicians and 60 visual artists from Pittsburgh and 9 countries around the world have performed at VIA since the festival launched in 2010. A Pittsburgh-based collective, VIA is volunteer-run and could not happen without the support of corporate sponsors, educational and non-profit partners, small businesses, and individuals like you. Thank you!